Attendance at Warner Park Stadium for Tuesday’s Cricket World Cup match Scotland versus South Africa far surpassed that of all the previous match days. This was due largely in part to the 1000 primary and secondary school students who received tickets to attend Tuesday’s game courtesy of the Government of St. Kitts and Nevis. The students lined up as early as 9 a.m., creating long queues that extended from the Lozack Road entrance, around the corner and down Victoria Road. The eager youngsters didn’t appear to mind the numerous security and gate checks as their backpacks were searched and their bodies scanned with handheld metal detectors. Sponsors of the event also made tickets available by having radio talk show hosts provide give-aways where listeners could call in and win tickets to the cricket matches on Tuesday and Thursday. Cricket goers got a rare treat during last Sunday’s game when history was made before their very eyes. 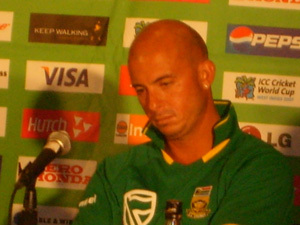 Herschelle Gibbs of South Africa hit six consecutive sixes in one over in their game against the Netherlands, setting a Cricket World Cup record. Sir Garfield Sobers, a former West Indies player, had previously held the record of six consecutive sixes. Sobers’ record, however, was set as a first in world-class cricket. During a press conference held to mark Gibbs’ accomplishment, Sobers said he had set his record in a different era when players were paid £5 per match but played for the love of the game despite the minimal remuneration for their efforts. Gibbs admitted that the short boundaries and swift pitch of Warner Park Stadium aided his amazing feat. He was rewarded with a cheque for one million US dollars from representatives of the Johnny Walker Company. Gibbs donated the prize to the Habitat for Humanity charity organisation. Minister of Sport Ricky Skerritt said St. Kitts had been firmly ensconced in the history books of Cricket World Cup. “We congratulate Mr. Gibbs on his outstanding performance in Sunday’s match. It was a fine display of batsmanship. It is significant for him on a personal level and it holds its own significance for us as a host venue that this feat was accomplished here in St. Kitts in our very own Warner Park. Gibbs’ World Cup record is likely to live a long time and Warner Park, St. Kitts will be mentioned on most occasions that the record is referenced by cricket writers and radio or TV commentators and that can only further catapult us forward as we aspire to become an international cricket venue,” he said. Gibbs’ monumental day was shadowed only by the sudden death of Pakistan coach Bob Woolmer that same Sunday. Just one day after Pakistan’s chances of advancing in the tournament were crushed following a surprising loss to Ireland in the CWC matches being held in Jamaica, Woolmer was found unconscious in his hotel room. He was rushed to University Hospital where he died not long after. An autopsy report was scheduled to be conducted sometime this week to determine the cause of the 58 year-old’s death, although authorities are said to be treating the matter ‘with suspicion’.